Performers include: Florence Henderson, Robert Reed, Ann B. Davis, Barry Williams, Maureen McCormick, Eve Plumb, Susan Olsen, Christopher Knight, Mike Lookinland, and Robbie Rist. One of the most popular sitcoms of the 1960s, this series tells the light-hearted story of a blended family in Southern California. In the pilot episode, widowed architect Mike Brady (Robert Reed) marries single mother Carol Martin (Florence Henderson). 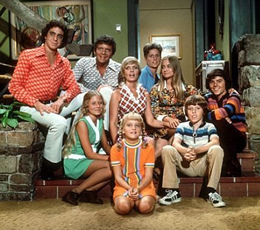 Mike has three young sons — Greg (Barry Williams), Peter (Christopher Knight) and Bobby (Mike Lookinland) — while Carol has three young daughters named Marcia (Maureen McCormick), Jan (Eve Plumb) and Cindy (Susan Olsen). The new family lives and learns together along with the help of wacky housekeeper Alice Nelson (Ann B. Davis). Did Ann B. Davis of the Brady Bunch pass away recently? @Donna Wiener Anderson: Nope. She’s still with us — at age 84.